Aside from his career in the United States Navy, Dr. Charrier has lived in southeast Texas his whole life. He holds two bachelors degrees in Music and Biology and earned a Doctor of Optometry degree from the University of Houston. He is a Diplomate in the Cornea, Contact Lenses and Refractive Technologies section of the American Academy of Optometry, an earned distinction held by less than 1% of optometrists in the United States. As a naval officer, Dr. Charrier served as Director of the Specialty Contact Lens Clinic at the Naval Hospital in San Diego, California. While there, he served military members and their families in comprehensive and medical eye care as well as fit medically necessary contact lenses on patients with eye disease or trauma from the battlefield. Dr. Charrier’s experience in specialty contact lens fitting is truly impressive. During his time at the Naval Hospital, his success in treating highly complex patients caused his patient base to expand over nine states and the south pacific. In his time at the Naval hospital, Dr. Charrier routinely treated patients suffering from war injuries, traumatic brain injuries and corneal diseases. Furthermore, he served as an optometrist to our nation’s elite warfighters and pilots including SEALS and the famous Blue Angels. In his career, Dr. Charrier has treated thousands of complicated patients and continues to have one of the largest specialty contact lens practices in the country. Since leaving the Navy, Dr. Charrier has become an important referral source for Houston area optometrists and ophthalmologists in helping complicated patients see clearly and comfortably. Additionally, Dr. Charrier served as faculty to the ophthalmology department providing lectures on optics and contact lenses as well as clinical rotations for the residents. Dr. Charrier was awarded the Navy and Marine Corps Commendation Medal for his work with the residents. He served as a voting member of the Naval Medical Center’s Executive Committee of the Medical Staff and was selected as Division Officer for the Optometry Department. 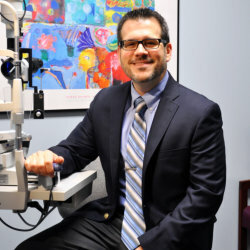 Dr. Charrier has obtained Fellowship status in the American Academy of Optometry and has held Associate Professor positions in optometry at Southern California College of Optometry, Pacific University, and currently at the University of Houston College of Optometry. As such, it is common to see residents and interns training at the practice with Dr. Charrier.